Morse (1791-1872) studied at Yale and in Europe and became a quite successful painter of portraits. His most famous oil painting (1821-2) was of a session in the old US House of Representatives in the Capitol. It is a large painting with many of the faces of representatives recognizable, and was exhibited around the country for a fee; the original is now on display at the Corcoran Gallery in Washington and a small version is displayed in the hall which Morse painted, now housing statues of famous Americans. Congress in 1842 finally authorized a telegraph line from Washington to Baltimore, operated after 1844 (the plaque shown is along US Rte. 1 in Beltsville, Md., south of the Muikirk Rd. overpass). The telegraph spread rapidly (especially along railroad lines) and Morse's elaborate paper tape instrument was soon dispensed with when a telegraph operator named James Francis Leonard learned to listen to clicks of the magnet and decode the message by ear; his example set a new trend (other telegraphers may also have made that discovery). He died of typhoid while serving in the Confederate army and his grave in Frankfort, Kentucky was later marked by a 12-foot marble monolith (thank you, Greg Good, for this story). Thomas Alva Edison, the inventor, started his career as a telegraph operator. In the US Civil War the telegraph was used extensively--even to communicate from tethered observation balloons to the ground. Incidentally, electricity was also used by the Confederate military to set off underwater mines, known as torpedoes. When Admiral David Farragut, in the battle of Mobile Bay, said "Damn the torpedoes... full speed!" he ordered his ships to continue the attack even though one has been sunk by a mine. Russia used similar mines in the Crimean war. The cigar-shaped underwater missile guided by gyroscope, initially known as the "Whitehead Torpedo," was developed (much later) in Europe. Soon after the telegraph was invented, undersea telegraph cables were laid, starting with an 1850 link between England and France. In 1857-8 a cable was laid between Europe and the America, but it operated very slowly and soon failed. Another was laid in 1866, but the capacitance and inductance of the long line distorted the signal--what was sent out as crisp square blocks arrived arrived with profiles like heaps of sand, which tended to blend if they were not widely spaced. William Thomson--later Lord Kelvin--was active in advising the cable construction, and later Oliver Heaviside and Michael Pupin modified the cable to reduce signal deterioration. Cables in the 20th century contained "repeater" amplifiers to preserve the signal, while modern technology introduced lasers and fiber optics, also communication satellites. The creation of radio waves by Heinrick Hertz was just the first step. 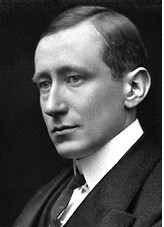 Hertz died at a young age, but the Italian inventor Gugliemo Marconi successfully expanded his invention and turned it into a commercial success (earning a Nobel prize along the way). Initially, radio waves were detected by coherers, glass tubes filled with metal shavings. Radio waves made the shavings cling together, increasing the tube's electric conductance and thus able to detect signals in the Morse code (and also detect lightning, by Aleksander Popov in Russia in 1894). Using a ship Marconi studied the range and worked to extend it, and in 1903 his shore station at Cape Cod, Massachussetts, detected transmissions from England. (The remains of the station are now part of a National Seashore Park, but were relocated further inland after parts of the shoreline were washed away in storms.) His company employed Reginald Fessenden to build high-frequency spark transmitters for ships, from which came the nickname "Sparks" for naval radio operators and the German verb "funken" (to spark) for wireless communications. Another employee was David Sarnoff, who reputedly picked up distress signals from the sinking "Titanic" and who later headed RCA, the Radio Corporation of America.